Application guidelines for the 2016-2017 Adjunct Faculty Development Fund are now posted in the Connections Office of Academic Affairs Policies and Guidelines channel. Last spring, the Office of the Provost announced the establishment of a fund for Webster University adjunct faculty development for 2016-17. The goal of the Adjunct Faculty Professional Development Fund is to provide support to eligible adjunct faculty for professional development, professional travel, and research activities. The Office of Academic Affairs has published guidelines for the distribution of the funds, which will be awarded through a competitive process. Eligible faculty are those who teach and live in the United States, have taught 27 credit hours at Webster or have been teaching for three academic years, and are teaching or scheduled to teach at the time of application. 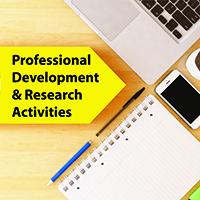 The guidelines provide more detail on the use of funds for professional development, professional travel, and research activities. Expectations of fund recipients, including the requirement of a final report, are also covered. "Webster's adjunct faculty members are accomplished individuals who bring real world experience and expertise into our classrooms," said Provost Julian Schuster. "Providing financial support for their professional development and research activities will enhance our students' educational experiences and raise the visibility of our adjunct faculty's accomplishments internally and externally. I look forward to seeing the results of projects undertaken this coming year." Criteria for evaluation of applications by the Adjunct Faculty Professional Development committee include the benefit to Webster University students, the contribution to the teaching expertise/experience of the applicant, and the contribution to visibility and reputation of Webster. Adjunct faculty will apply through an electronic application, which will require a summary of the request, a budget, current CV/resume, and a letter of endorsement from an adjunct's department chair or campus director. The application period will open on August 15, 2016 and close on September 15, 2016. Applicants will be notified by mid-October. The guidelines are available in Connections in the Office of Academic Affairs Policies and Guidelines channel. Please address questions to Rita Smith, director, Academic Resources and Planning, Office of Academic Affairs, 314-246-6914.